Complete uniform requirements are detailed below. School uniforms are available at many stores such as Lands’ End, Burlington Coat Factory, Walmart, Penney’s, K-Mart, Sears, and Target. Shop early for best selection. PROP also has periodic sales of Logo Shirts and Spirit Day shirts throughout the year. These sales events are posted on the calendar. Students should be well groomed and neat in appearance. All clothing is to be well fitted (neither oversized and baggy, nor tight and form fitting) and in good repair. Plain standard polo shirts or turtlenecks in solid navy blue, white, hunter green, or light blue without striped collar or sleeves are permitted. Any undershirt that is worn beneath a shirt (and is still visible) must be solid white or match the color of the outer garment. Long-sleeved shirts may be worn under Spirit Day shirts, and they may be worn under short-sleeved uniform shirts. Short or long sleeves are permitted. Only a small manufacturer’s logo (1”x 3” or less) or school logo is permitted. Must be tucked in at all times, not just rolled at the waist. Spirit shirts and current-year sports team shirts be worn on Spirit Days. Solid navy blue or khaki (beige) are permitted. Must be uniform style to include a waistband and belt loops (except for K-2nd grade). Must not touch the ground or be shorter than the top of the anklebone. Straight legs, hemmed, and well fitted at the waistband (Example: DockersTM classic style or traditional uniform style). Fabric should be cotton/cotton blend, polyester blend, or corduroy. No side stripe, bell-bottoms, cargo, carpenter, or hip hugger styles. K-2nd grade are not required to have belt loops (elastic waists permitted). K-2nd grade: if pants have belt loops, a belt must be worn. 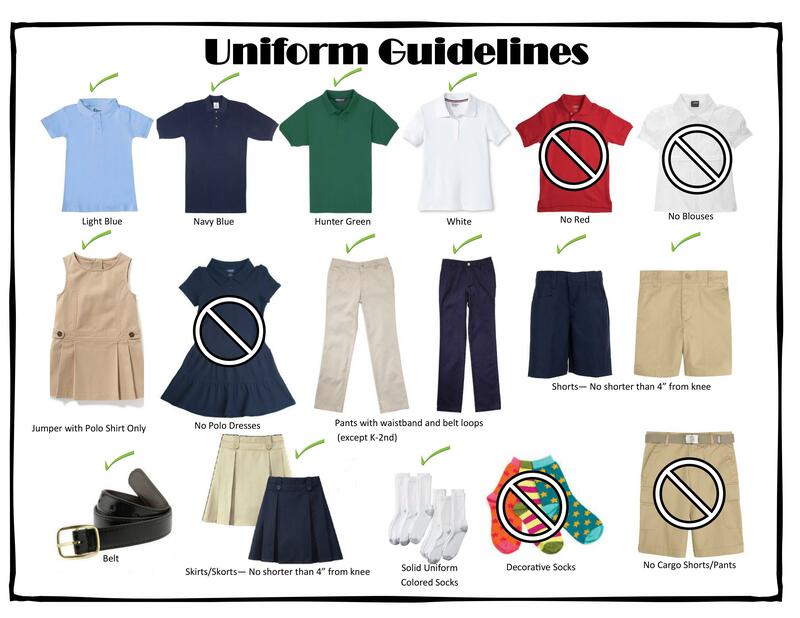 Must be uniform style (no baggy styles) and include a waistband and belt loops (except for K-2nd grade). Must be no shorter than 4” above the middle of the knee and no longer than the middle of the knee. Must be no shorter than 4” from the back of the knee. K-6th grade girls are encouraged to wear shorts under their skirts. Approved shirts must be worn with jumpers. Plain, non-hooded sweatshirts, cardigan sweaters, or windbreakers worn over a polo or turtleneck in solid white, navy blue, hunter green or light blue are permitted. No other outerwear may be worn in the building/classroom. Shirt collar must be visible at neckline of outerwear. May not extend past the knee or be shorter than waist. Sweatshirts and sweaters are to be worn appropriately and not tied around the waist or shoulders. K-2nd grade: if shorts/pants have belt loops, a belt must be worn. Must be worn by 3rd – 8th grades with pants/shorts. Belts must be secured in loops and buckled firmly at the front. Belts must be simple in ornamentation and can be leather, plastic, or fabric in construction (no rivets or studs). Shoes must have closed toes and closed heels. No sandals or slipper-type footwear. No cleats may be worn. Maximum heel height for grades K-3 is 1”. For grades 4-8, the maximum heel height is 2″. Heel height is measured from where the heel is attached to the back of the shoe at its highest point. Shoes must be secure on the foot (tied, zippered, straps, etc.). No boots of any type or shoes with wheels are permitted. Solid colored socks in white, hunter green, light blue, navy blue, khaki, or black must be worn. Girls may wear tights/hose in solid neutrals (example: white, navy blue, black, hunter green, or khaki) Footless tights/hose may not be worn. Hats may only be worn outside only. Must not cause a disruption to the spirit of the dress standard. Must be worn with the bill facing forward. No head scarves are permitted in the classroom. No faddish hairstyles (Example: spiking, shaved designs, mohawks, etc.). No unnatural coloring, highlights, streaking, or hair extensions. It is recommended that boys be clean shaven and have hair cut above the ears and length above the collar. Hair must remain out of the student’s face. May wear a simple pair of earrings in the lobes only. No other piercings may be worn. For safety reasons, hoops must wrap snugly around the ear lobe. May wear a single strand necklace (no chokers), a ring, a wrist bracelet (no sweatbands), and basic wristwatch. No smart watches. Students will be permitted to wear only light, natural makeup (no glitter, eye shadow, mascara, or eye liner is permitted). Only clear, pale pink, pale beige, or French-style plain nail polish will be permitted. Makeup and nail polish must not be brought to school. Only clear (no tint) chapstick or lip gloss is permitted in school. Will not wear tattoos (permanent or temporary). Inappropriate attire is not limited to the foregoing. Administration and teachers have discretion to make administrative decisions on inappropriate clothing and accessories. This policy may be adjusted if stricter guidelines are required or if standards detract from the learning environment. The Painted Rock Academy dress standards are designed to promote unity among the student body and reduce distractions to the academic program.